The original website was designed by tkiowa.com, a company located here in Iowa City. 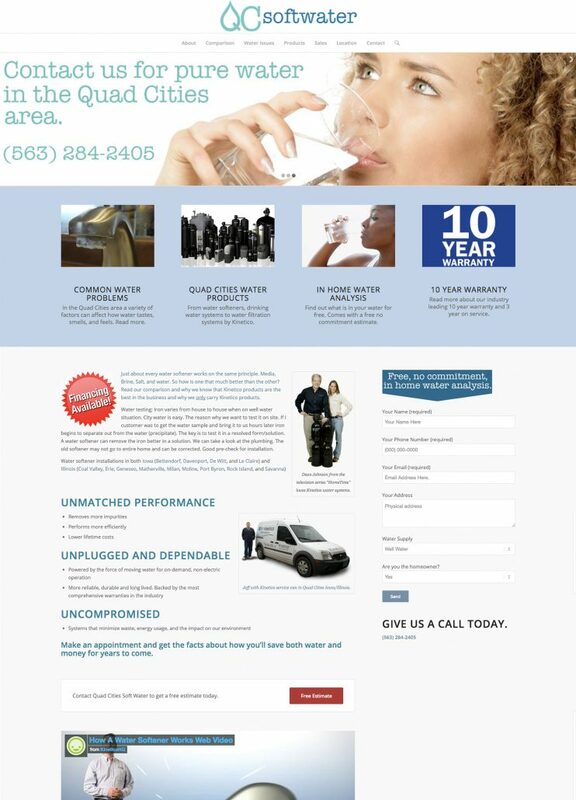 That original website sat there for over a year with little to no new traffic or conversation for a Kinetico water system installation company. Please note that TK is still claiming to have done business with Kinetico on it’s company website. Technically this is true, but the owner of this website dumped them for us. That is when the owner Brian DeCoster contacted us to completely redo the entire site and actually get it found online. A little over a year later QC Softwater has a massive facelift and an incredible jump in Google Analytics (website traffic). Also, the main installer for that company, Jeff, stays busy with follow-up and actual installations that are now able to keep the company alive. Search engines wise the original company missed every opportunity to be found online. We created a blog highlighting past water softeners installed in the Quad Cities area. Kinetico dealers are sold a territory for home water softeners. So when you search for water softeners in Davenport, Iowa, or Moline, Illinois, there is a really good chance that you will see QC Softwater show up in the results. Unfortunately, we don’t have pictures of the original site before we took it over. TK created the original website using stock Kinetico artwork that was overwhelming to the viewing and didn’t guide to read, do research, but more importantly give the online viewer a “Call to Action” button to guide them along the conversion process of calling or filling out an online form to contact Jeff. Searching for a water softener in the Quad Cities often results in seeing this client’s site. It’s not alway number one. We can not guarantee that and neither can anyone website design company out there. But we’ve done a fantastic job targeting this industry in the local area. The client couldn’t be happier with the dramatic increase in business. We’ve also helped out with direct mailers to help get the word out as well. This company continues to grow in the area.